Niger's city of Agadez has been transformed from a bustling trade hub in the middle of the Sahara desert into a refugee centre for the thousands of African migrants fleeing the violence in Libya. For the last two months, a large convoy of trucks has been driving into town each week. The flow has now eased to about 10 vehicles packed with between 1,500 and 3,000 people. 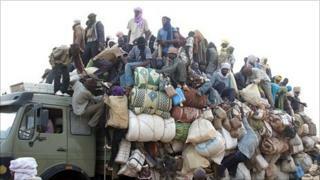 Figures from the beginning of May put the number of migrant arrivals over the Sahara from Libya at 65,000. The figure is more than six times the number of migrants that have landed on the Italian island of Lampedusa from Libya in the same period. In the 48-degree heat, exhausted from their gruelling trip, thirsty and hungry, they unload the luggage they managed to bring with them on the journey which takes more than a week. "The journey is between life and death. Many people do not make it to Niger because of hunger," says Abdulaziz Abdullah, a Ghanaian mechanic who worked for four years in the Libyan capital, Tripoli. Slumped over luggage piled up in the compound of the Agadez custom's office, which has been transformed into a camp for the migrants, Mr Abdullah says he is grateful just to have safely arrived in Agadez. "If I showed you a [recent] photo of myself, you wouldn't recognise me. But I thank God I'm alive, though I've lost everything," he says. He decided to join the convoys heading south after his home, near a military camp in Tripoli, was bombed on 28 March and he lost all his workshop equipment. The trucks are organised by the International Organization for Migration (IOM) in Tripoli and various West African embassies who liaise with the Libyan authorities to guarantee their safety for the trip. But the desert trip for each truck carrying about 150 people is still fraught with hazards. "On our way, we saw a truck that caught fire, all of its occupants got burned. Next, we found another truck which had had an accident in which 40 people died straight away, while many got severe injuries," says another Ghanaian refugee, Ibrahim Harun Hafiz. He sold vehicle spare parts in the port city of Misrata until this year's rebel uprising against Col Muammar Gaddafi developed into an armed conflict drawing in a Nato-led coalition. Other refugees at one of four camps set up in Agadez by the regional authorities, the IOM and UN refugee agency had come from the southern Libyan city of Sabha. "I sat on top of the luggage to get here," said Mariam, a 40-year-old Nigerian from Edo state, who had spent two years in Sabha. Her travelling Nigerian companion Loe said it was a difficult decision to leave, but life was too dangerous to remain. "The bombing was too much and people were dying," she said, adding that for the last 10 days she had survived on water alone. Niger's President Mahamadou Issoufou told the BBC he expects the number of arrivals to total 105,000, though this also includes some people who fled recent insecurity in Ivory Coast. The aim of the authorities and aid agencies is to tend to the urgent medical needs of the migrants and returnees and then organise their onward journeys before the trucks from the next convoy arrive. Niger nationals are directed to the biggest camp, erected on a football pitch, where the government organises buses to their home districts. In the other camps, the IOM works out the routes home and pays for the trips of the West African migrants. Despite some complaints about a rise in crime, most Agadez residents are sympathetic to the plight of those fleeing Libya. The city is dominated by Niger's Tuareg community, which has had a close relationship with Col Gaddafi. Over the years he has helped resolve various rebellions led by Tuaregs, most recently demanding a greater share of profits from the region's uranium mining. In 2009, the Libyan leader oversaw a peace deal which guaranteed an amnesty for 4,000 Tuareg rebels who disarmed with the promise of jobs. But Saidou Kaocen Maiga, a spokesman for the ex-fighters, says many remain unemployed and have now taken up an offer to fight in Libya for Mr Gaddafi. "The Tuareg fighters I've spoken to say they are paid 1,000 euros [$1,400, £870] a day in the Libyan army," he said. Those leaving Libya were unable to confirm seeing foreigners fighting for Mr Gaddafi, saying they had not been to the front lines. But Niger farmer Ali Mohamed, who worked for a Libyan landowner in the countryside between Misrata and Benghazi raising camels, said sub-Saharan Africans had been attacked by rebel sympathisers in the east who mistook them for mercenaries. "I witnessed having seen dead bodies of African people killed by the Arab fighters in Libya," he said. "Those Arabs opened fire indiscriminately and that was the reason why we fled." The majority of people at the camps had lived in the west of Libya, under the control of pro-Gaddafi forces, and, like many Agadez residents, were angered at the Nato-led attacks. "I was in Libya for eight years and I think Muammar Gaddafi, he is the best leader Africa has ever had," said Mr Hafiz, who travelled to several African countries as a footballer before he went to Libya. "In Libya, I see 100% difference: I don't pay for lights bills, I don't pay for water. The price for commodities is very good - just one dinar [$0.80, £0.50] for a sack of rice," he said. "These Western powers are rushing in Libya simply to collect its petrol [oil]." Fellow Ghanaian Mr Abdullah agreed. "Now we are begging on our knees to tell our African leaders to do something. This is an African matter, this is not a European matter," he said.